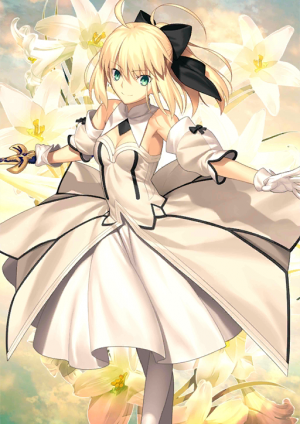 This article is for the 4★ Altria Pendragon (Lily). 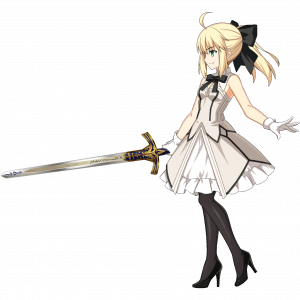 For 5★ , see Altria Pendragon. 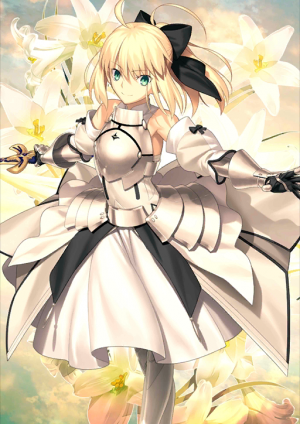 The 4★ Alter version of Altria Pendragon can be seen here. 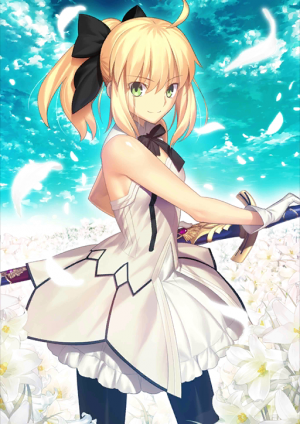 Awarded to players for completing the Saber Wars Event. 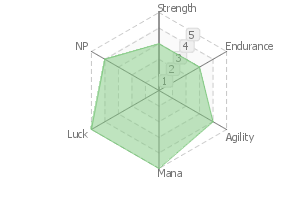 Increase attack and star generation rate of all allies by 10% while she's on the field. Pulling Caliburn the Sword of Selection out, this is the Altria who just started walking the path of kingship. Because of such, she's still a half-boiled knight. She's as fresh faced as a lily, and her eyes are filled with glimmering hope. She walked across the country to experience many things, and left many adventures to tell. Those saved by her praise her as the Princess Knight from her elegance. Training to be a king is rough, but if I can take care of my horses, I'm happy. A romantic knight who betters herself daily to become the ideal king. She is still half-boiled so she still acts like a girl, and her heart is filled with dreams and hope. When she vacations in different countries, she spends her time with her brother-in-law Sir Kay, and their accompanying mage Merlin. Things usually start with Altria making a fuss, then frustrating Merlin, and Kay picking up the pieces. Always "feels" the optimal flow for herself during battle. Her honed sixth sense is almost precognition. Reduces the effect of any interference to her sight and hearing. However, having good hunches is not so good... she acutely picks up the worries of everyone she meets, so she ends up helping each and every person she comes across. Golden Sword of Assured Victory. Originally a sword used to select a king, the "Anti-Personnel" is not against an enemy, but to one who will wield the sword in the future. 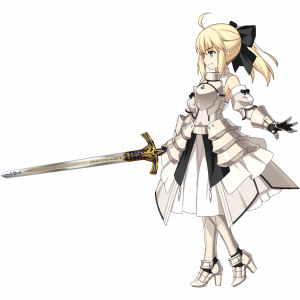 If the wielder stays just as a king, and is finally deemed worthy, its strength will be appropriate for a sacred sword. The destined child born to save Britain from is destruction and path to ruin. A "reincarnation of a dragon" created by the previous king Uther and the mage Merlin. This is why she is referred to as the Red Dragon that protects Britain. Has the heart of a dragon, the highest rank of phantasmals, and the amount of magical energy that can be created within her body overwhelms all other Heroic Spirits. Caliburn and Excalibur are different sacred swords. Caliburn nurtures royalty, and raises Arthur into a king. Originally, Caliburn was to be used for ceremonies. Using this as a weapon by releasing its True Name can exert the same firepower as Excalibur, but the sword will not be able to withstand Altria's magical energy and will likely disintegrate. 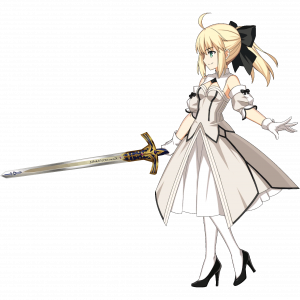 The figure of Artoria from after she drew out the sword of selection Caliburn and first started walking down the path of a king.A girl-knight who is still somewhat unpolished. Her figure is like that of a lovely lily, and her eyes are filled with glittering hope. While wandering around all over the country to accumulate experiences, she left behind many adventure stories. It seems that those she saved praised her flamboyance as a knight-princess. Although the training to become a king is harsh, I'm happy as long I can take care of the horses. A romantic knight who practices daily in order to become the ideal king. 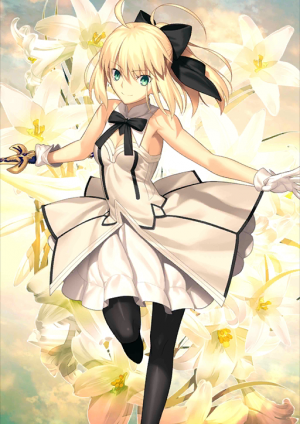 Although still inexperienced, her girlishness has not yet been wiped away and her heart is filled with hopes and dreams.Her party during the tour around the country was composed of her step-brother, Sir Kay, and the attendant magus Merlin. It started with Artoria's meddling, became out of hand with Merlin's chaffing, and finally Kay ending up covering for everybody. The ability to always grasp the most suitable developments for oneself during battle. Her sharpened sixth sense is already close to premonitions of the future. Reduced by half hindrances that interfere with the senses of sight and hearing. However, having a good intuition is also problematic. At any rate, because she ends up grasping the troubles of the people that catch her eyes, she unconsciously ends up giving a helping hand to each new person she meets. Originally a sword for the sake of selecting the king. Its Anti-Unit classification does not refer to the enemy, but instead point to the one who shall have ownership over it from now on. When the owner turns into a proper, perfected king its power will become appropriate for a holy sword. A child of destiny born to save the Isle of Britain, which was headed towards ruin with the fading of mystery.An "incarnation of the dragon" created by the previous king Uther and the magus Merlin. Because of this, she is likened to the red dragon that protects Britain.Possessing the heart of a dragon, which belongs to the top ranks of the Phantasm species, the amount of magical energy she can generate inside her body overwhelms other Heroic Spirits. Caliburn and Excalibur are two different holy swords.In a sense, Caliburn was prepared for the sake of rearing King Arthur as a king, a member of royalty.Originally, Caliburn was meant for ceremonial use.If it is employed in battle as a weapon and its True Name is released, firepower on the same scale as Excalibur will be displayed, but its blade will probably be unable to withstand Artoria's magical energy and break. 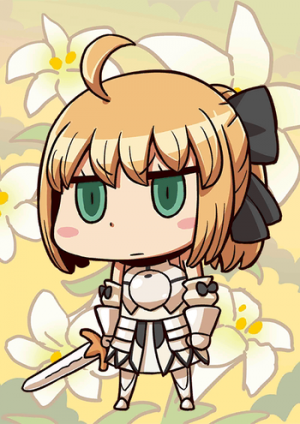 Prior to the Saber Wars, Saber Lily could only be obtained with a pre-registration code and it was impossible to upgrade her Noble Phantasm. She was given to players of the English server who started the game before August 1st 2017 as a prize for completing a pre-release Facebook campaign. This page was last modified on 17 February 2019, at 02:26.